The revitalization of Old East Durham has resulted in a dramatic increase in property values over the last 10 years. What does this growth mean for housing affordability, equity, and environmental quality in one of North Carolina’s fastest growing areas? To find out, the UNC Department of City and Regional Planning is listening (and lending resources) to long-term residents of Durham. Danielle Spurlock speaks at a neighborhood town hall meeting in east Durham on February 25, 2017. Fruit platters, hummus and veggies, chicken wings, home-baked cookies, and large pitchers of sweet tea and lemonade cover a long table at Holton Career and Resource Center. It’s the third Tuesday of the month, which means Communities in Partnership, a neighborhood initiative of old East Durham, is hosting their monthly potluck. Across from the table, Karla Jimenez, a graduate student from the UNC Department of City and Regional Planning, talks with a long-term resident of east Durham. Together they examine a large map of the neighborhood, and Jimenez asks her questions about local businesses and economic opportunities in the area. The conversation switches to food deserts, and while Jimenez listens intently to this woman’s concerns about her neighborhood, another graduate student from UNC is taking down notes from their conversation. This is what community mapping looks like, and it’s one of the ways UNC researchers hope to help some marginalized neighborhoods in east Durham. Those construction projects result in higher property values. When the homes are renovated, new trees are planted, which has been deemed “green gentrification,” according to Spurlock. “Once you see green projects going in, it’s associated with gentrification as well,” she says. The small team of university researchers established a relationship with Communities in Partnership. That is Spurlock’s goal—to show the numbers within the context of real everyday life for these residents. On Driver Road, just down the street from the Horton Career and Resource Center, sits a block of housing units with three bedrooms. One resident told Spurlock: “I looked at that and thought about how we could make a three-bedroom work for our family—and then I saw the price.” These units used to be affordable—around $600 a month. Now they are $1,600. Much of Spurlock’s contribution is the ability to structure the conversation. What are the major issues? The most common responses include transportation, lack of economic opportunities, and housing affordability. In addition to Spurlock’s community mapping, the project includes support for PhotoVoice, organized by Deborah Gallagher at the Duke Nicholas School for Environment, and Walkshops, led by NC State’s Kofi Boone. “PhotoVoice is a platform for community members to share personal reflections about their neighborhood and to visually depict challenges and opportunities for change,” Gallagher says. 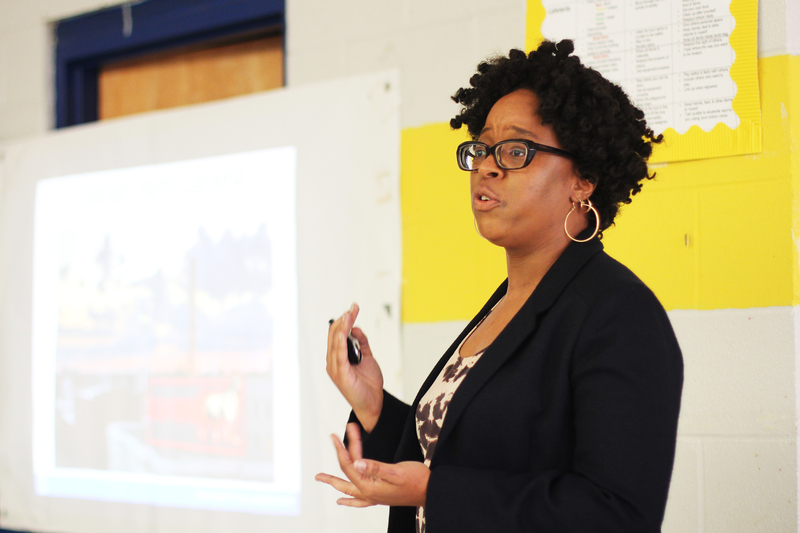 “The goal was to physically explore the area to learn about the community’s issues with transportation, housing, the environment, and the local economy,” Boone says. Spurlock’s community mapping initiative involved bringing large scale maps to neighborhood meetings. As residents perused them, her graduate students asked questions and initiated discussions to help capture the narratives of housing affordability and transportation access. Respecting a community for its expertise is the key to all of this. “I have a set of expertise in certain fields, but I’m not an expert in the lived experience of folks day-to-day,” Spurlock says. “And that is just as valuable when it comes to making policy as the expertise I can provide when we’re talking about re-zoning and building permits. Danielle Spurlock is an assistant professor in the Department of City and Regional Planning. Karla Jimenez is a graduate student from the UNC Department of City and Regional Planning. Camryn Smith is a resident of old East Durham and a founding member of Communities in Partnership. Deborah Gallagher is an associate professor of the Practice of Resource and Environmental Policy at the Duke Nicholas School for the Environment. Kay Jowers is a senior policy associate in the state policy program at the Duke Nicholas Institute. Kofi Boone is an associate professor of landscape architecture at NC State’s College of Design. The Kenan Creative Collaboratory is supported by the William R. Kenan, Jr. Funds and facilitated by the four Kenan Institutes across the state of North Carolina.